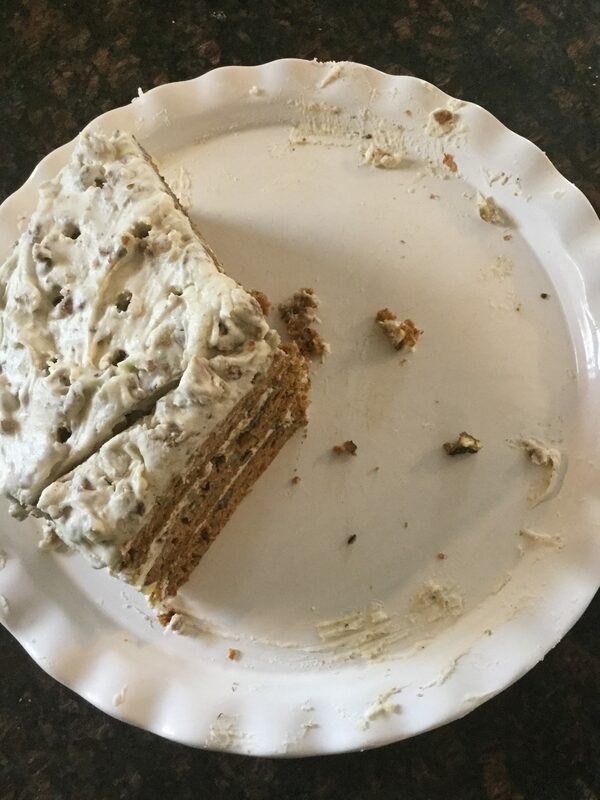 My dear husband, bless his heart, baked me a carrot cake for my birthday and even agreed to let the camera roll in the process. He did a great job; however, I figured you might want a few more specifics like the quantities needed for many of the ingredients so here is the detailed recipe. This cake was fantastic, and I’m not just saying that because I love carrot cake. You will not miss any of the oil or sugar (which are substituted) – I promise. The cake is moist, full of flavor, bursting with carrots and pecans, and is somewhat healthy – minus the frosting. Sorry, we forgot to get a picture of the finished product before we dove in and enjoyed. Mix first three ingredients together. Add the eggs. Mix well. Add the carrots and mix. Combine flour, cinnamon and baking soda and slowly add to the liquids. Mix well. Stir in the pecans. Grease 3 cake pans and bake at 350 for about 20 minutes. Let cool before frosting. Mix first two ingredients well. Add vanilla. Mix. Add sugar slowly. Mix well and then add 1 cup of pecans.